DUIs, incriminating paparazzi photos, erratic public behavior—Hollywood handlers have found a convenient way to excuse the bad habits of their rich and famous clients: Send them to rehab. Mr. Della Valle is no stranger to overcoming addictions. He spent over twenty years in the grips of drugs and alcohol, losing his family, his job and his freedom along the way. He only turned his life around when he fully committed to the recovery process. Because of the many high-profile people who have entered rehabilitation for drugs or alcohol, it’s become more socially acceptable to admit that you have a problem and seek help for it. Della Valle, however, worries that it’s gone too far. “There is nothing cool or admirable about being an addict, no matter how much the media tries to make it look that way,” he says. Stephen Della Valle is president of the board of directors at Turning Point rehabilitation center in Verona, New Jersey. Currently celebrating twenty years of sobriety, he lives in Oak Ridge, New Jersey, with his wife, Donna. He has three children. 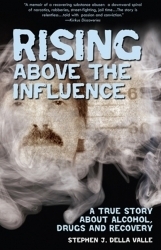 Rising Above the Influence is available now (ISBN: 0-9801776-0-X; softcover; Oak Ridge Press) on Amazon.com, Borders.com, BarnesandNoble.com, and at fine bookstores everywhere. Click here to view the list of recent Press Releases from Arbor Books Inc.